These welded eye bolts are zinc plated meaning they are durable and hard wearing. Our zinc plated welded eyebolts can be great for fencing uses. Our zinc plated eyebolts can be used for various things including on vehicles for an attachment point. Fantastic when used for attaching a securing eye to a structure. Our Zinc Plated Eyebolts Are Perfect For Fencing Uses. Our zinc plated welded eyebolts are perfect for fencing. 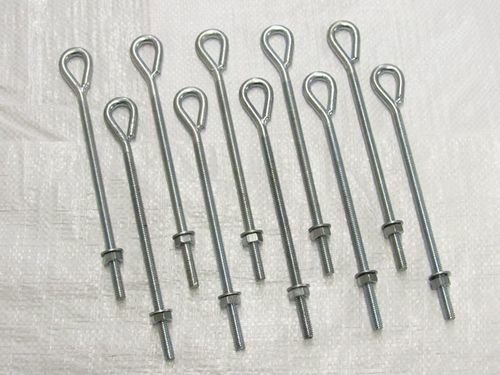 These zinc plated eyebolts are suitable for many uses such as on fencing equipment. Here at SecureFix Direct, we offer a range of welded straining eyebolts, complete with nuts and washers, perfect for use when straining wire in fencing. We understand that product life and durability are some of the most important factors when it comes to purchasing garden fencing and landscaping supplies. This is why our products are made with the highest quality materials. Our welded straining eyebolts are also zinc plated for extra protection, so they can withstand even the most adverse weather conditions. The straining eyebolts in this collection are welded to provide a gap free design. Why Choose SecureFix Direct When Purchasing Welded Straining Eyebolts? At SecureFix Direct, we have a long history of providing the highest quality products at some of the best prices on the market. We are determined to deliver high standards of customer service at all stages of customer interaction, whether you’re simply looking for advice on what product is right for you, or if you’re a returning customer looking for after-sale support. We also offer a free delivery and fast dispatch service with all of our products so you can be sure to get your products as quickly as possible. If you’re unsure about whether our welded straining eyebolts are right for your application, don’t hesitate to get in touch with a member of our friendly team today.